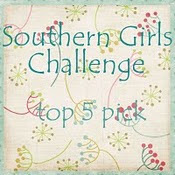 Kelly's Kreative Korner: Baby Girl is Sweet Sixteen! Baby Girl is Sweet Sixteen! Well our baby is sixteen, her birthday was Easter Sunday, however, we surprised her the Sunday before by having a few friends join us and had a surprise birthday party for her at the YMCA/YWCA in Winnipeg. Spent the afternoon at the pool and then went for supper. I got this image as a coloring page online, just googled anime and found this awesome picture. A super card Kelly and your image is coloured beautifully. But afraid you have combined more challenges than our Stampalot rules allow. Good news is there is still ten days before our challenge ends for you to join in with another piece. This is gorgeous and loving the pastel colours. 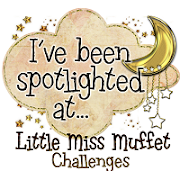 Congrats on your spotlight at Little Miss Muffet Challenges!